Idaho's songs are windy and mystical, though rooted in a glorious pop foundation, delivering cold chills and haunting hooks along side bright rhythms and bouncy beats. Lo-fi sounding recordings carrying out the indie segment of the program. And the sweet vocals and undeniable hooks capture the pop and bring it forth. 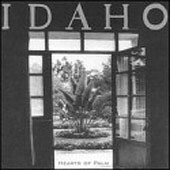 An addictive album from start to finish, Idaho play tight indie pop sure to keep your head (and the album) spinning for quite some time. I'll give it an A-.